It's finally here. 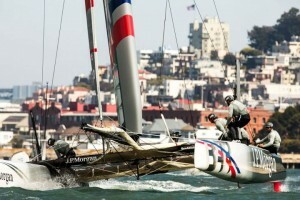 After much planning and anticipation, America's Cup has set sail on the San Francisco Bay. In its more than 150 years of existence, only four nations have won it. We really are, then, witnessing history in our fair city by the Bay. So get out there and experience the rush of the competition, the beauty of the boats, and the skill of the Skippers--right in the heart of the grand San Francisco waterfront. The AC Village at Marina Green, which is free and open to the public (bleacher seats are ticketed), provides views of all the racing, but we've put together the list of best places to watch America's Cup, in an out of the city. 1. Sausalito: View the races at this seaside town's numerous waterfront restaurants, bars, or parks. While you're there, grab lunch or dinner at Fish, which serves up some of the best and most sustainable seafood in the Bay Area. Directions: Take the Golden Gate Ferry from the Ferry Building to Sausalito. 4. Alcatraz: The same 360-degree views that one teased America's most notorious criminals make this glorious little island a fabulous spot for race viewing. Bonus: Plan a tour and get reacquainted with the Rock's fascinating history. Directions: Take the ferry from pier 41. 5. 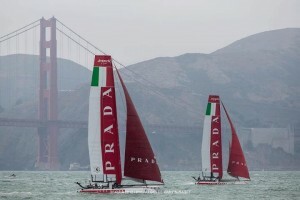 On the Bay: How much more luxurious does it get than watching the races from your own boat? If you have a boat, park it--if you don't, find someone who does and make a new mate. Or you can just snag a seat on one of a number of vessels--from the Blue & Gold Fleet to America, a replica of the beauty that gave this competition her name--that will be parked along the route. 6. Fisherman's Wharf: Walk the stretch from the Embarcadero BART station all the way to the Submarine Museum at Pier 45. Enjoy all the standard wharf attractions and stop for impressive (and quick!) meals at the Ferry Building. Directions: Take BART to the Embarcadero station. 8. Golden Gate Bridge: Take an easy 1.5-mile stroll across the red beauty and set up camp on either side (North or South). Pack a picnic and watch the boats whiz by below. Directions: Take BART to Embarcadero. From Fisherman's Wharf take any Golden Gate Transit bus along North Point St. All buses stop at the northbound Toll Plaza bus stop. 9. America's Cup Park: The city's much anticipated newest public park is now open at Piers 27/29. At AC Park you'll find not only primo views of the races, but a whole host of family fun, including a Flying on Water 4D AC72 simulator, Kids' Zone, and the bean bag-festooned PUMA Yard. While planning the festivities, the city of San Francisco and the America's Cup Event Authorities have taken great care to optimize sustainability--employing a zero-waste policy focusing on energy and emissions, recourse efficiency, natural habitats, and wildlife. In addition, AC partnered with leading ocean conservationist organizations to create the Healthy Ocean Project, the world's largest ocean literacy program. A full breakdown of the sustainability plan is available on the America's Cup official website.